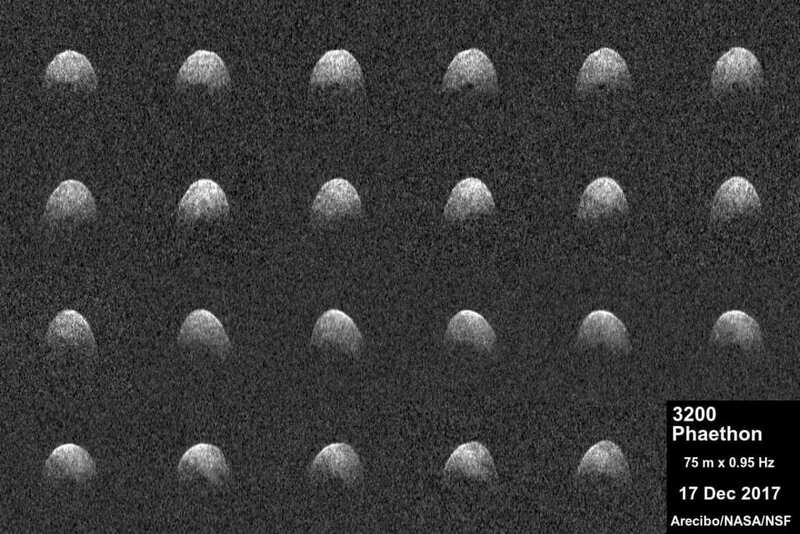 Polarimetric investigation of a near-Earth asteroid Phaethon was carried out in December 2017 on its closest approach to the Earth. The study was conducted in collaboration with scientists from the Ussuriysk Astrophysical Observatory and the Astronomical Institute of the Slovak Academy of Sciences. The article reporting the results of the observational campaign have been submitted to the scientific journal Astronomy and Astrophysics, where it successfully underwent the peer-review process and got accepted for publication. PhD-students Ekaterina Chornaya, Anton Kochergin and graduated student Alexey Matkin, led by Evgenij Zubko, the leading researcher at the Far Eastern Federal University (FEFU) School of Natural Sciences, studied the asteroid 3200 Phaeton using the polarimetric method. They measured the degree of linear polarization of the sunlight scattered from the asteroid in collaboration with their colleagues from the Ussuriysk Astrophysical Observatory and the Astronomical Institute of the Slovak Academy of Sciences. "In this study, I particularly appreciate the fact that, using very simple and relatively inexpensive tools, we have achieved the results which importance is comparable with those obtained with much bigger instruments in the world-leading astronomical observatories. We studied the Phaethon with a small telescope whose aperture (a primary mirror diameter) is of only 22 cm. However, we obtained results at the quite good quality. Surprisingly, our results appear to be more accurate than those were measured by some of our colleagues with much more powerful telescopes. This came true because of our non-standard solution: We decided to avoid any photometric filters except for the polarimeter." – commented on Evgenij Zubko. The scientist emphasized that Phaethon is of high interest for astronomers because of several reasons. First, it is a near-Earth object, which makes it possible to study Phaeton by various methods, including radars. Second, the asteroid has a very much elongated orbit and approaches the Sun at close distance, 1/6 of the Sun-Earth distance. For that reason, it gets heated up 750-1000 Kelvin (476 – 726 Celsius) every one and half year. That's why it was named after Phaeton, the hero of the Greek myth, the son of Helios (god of the Sun). The FEFU astrophysicists have shown that the Umov effect can be applied to the studies of asteroids, just like to the studies of comets. This physical law was discovered in 1905 by the Russian physicist Nikolai Umov. The crux of it is that there is an inverse correlation between the reflectivity of the surface and the degree of linear polarization of the sunlight scattered by it. In other words, the brighter is an object, the lower polarization it produces. Since the Umov law was originally developed to study the surfaces of relatively large objects such as the Moon, it should be proven that it could also be used in application to the small bodies of the Solar System – comets and asteroids. At the same time, the Umov law requires a very specific geometry of observation of the object that is difficult to achieve on practice for most of these small bodies. With Phaeton, it is possible due to its close encounters with the Earth. "The point is that the favorable conditions for observation of Phaethon happen every few years; whereas, the best observational circumstances occur only few times per century," says Evgenij Zubko. "In order to accurately retrieve the Umov law in asteroids, the investigation of several different asteroids is needed. We have now one such asteroid whose study has been already successfully accomplished. It is necessary to conduct an investigation of at least one more asteroid, preferably with substantially different polarization characteristics, in order to approximately estimate the Umov effect for asteroids," the scientist went on. According to the FEFU PhD-student Ekaterina Chornaya, their research list contains about 10 potential objects for study during the next two years and a subsequent comparison of their characteristics with Phaeton. When Phaethon was approaching the Earth in December 2017, it was observed by at least four groups of scientists in different parts of the globe. The results of measurements of the linear polarization of the sunlight reflected by the asteroid vary considerably from one group to another. This is noteworthy. Typically, observations of asteroids carried out by different teams tend to converge to nearly the same result. "A possible explanation is that the surface of the asteroid is highly heterogeneous: It may consist of different types of materials and/or has different microphysical properties of regolith. We can get such dispersion of the results because of the asteroid rotates fairly quickly and it can be observed from all sides during one night, " explains Evgenij Zubko, who made a preliminary report on the results of the Phaeton polarimetric study at The Ninth Moscow Solar System Symposium 9M-S3.